Crypho’s primary focus is the confidentiality of your data. Because of the high security focus, logging in requires two-factor authentication and a strong passphrase. It requires your email address, your passphrase and a time based security code. You created your passphrase when you signed up. Take special care of your passphrase. It is the basis for your cryptographic keys, and instrumental to the security of the application. In addition to the passphrase, you also need a time based security code for Crypho’s two-factor authentication. The two-factor authentication ensures that even if someone gets hold of your passphrase, they still cannot access your account. In addition to something you know (your passphrase), you also need something you have (usually your phone or your computer). 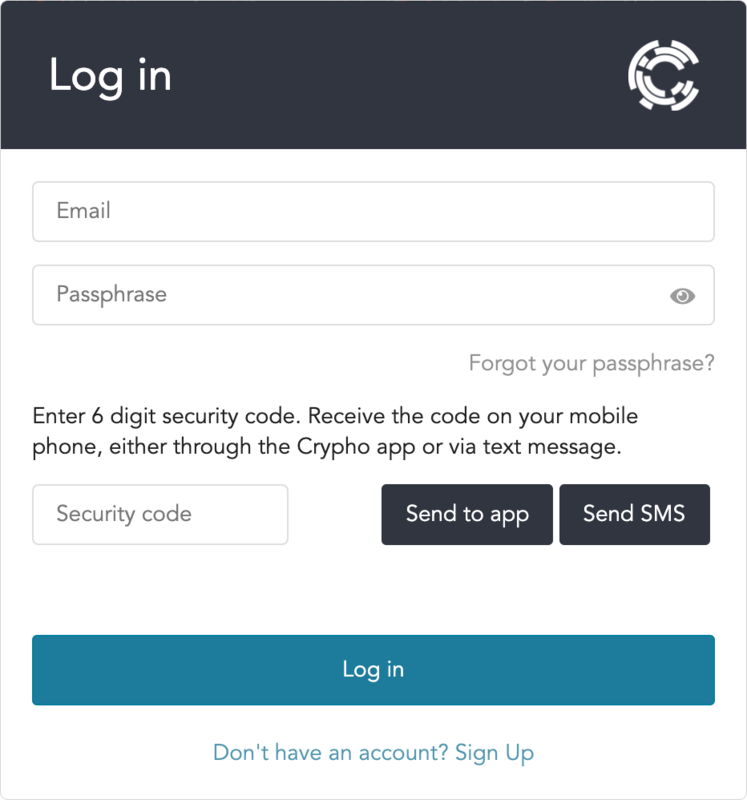 The security code can be generated on your phone from the Crypho mobile app. The security code can be generated on your phone from one of many available authenticator apps supporting TOTP, for example Google Authenticator. The security code can be sent to your phone as a notification, as long as you have the Crypho app installed and linked. To do this, click the Send to app button on the login form. You can receive the security code via SMS/text message. Click the send SMS button. An SMS with a six digit security code should arrive in a few seconds. Enter the six digits in the field and press Log in. The security code is also displayed on the Settings page inside the mobile app. The security code is valid for 60 seconds. If you wait too long, you will have to request a new code. By checking the checkbox This is a shared computer. Always ask for security codes Crypho will require security codes on every login attempt. If you leave the box unchecked, Crypho will not require a security code for the next two weeks on that computer. If you cannot remember your passphrase, read about resetting your passphrase.